World number one Mark Selby and world champion Stuart Bingham eased past amateur opposition to move into the second round of the UK Championship. Selby crushed fellow Leicester man Joe O'Connor 6-0, while Bingham saw off a gritty challenge from Northern Ireland's Jordan Brown to win 6-1. But crowd favourite Jimmy White could not earn a shock final-frame win over Scot Stephen Maguire. The 1992 winner White had led 3-1 and levelled from 5-3 down. A relieved Maguire, the 2004 champion, admitted he got his chance to see the match out thanks to a fluked red. "I was very lucky and he will be devastated," Maguire said. "But it happens to us all. It was a good match and it's a great result for me." White, 53, said: "I played well and was competing with him at all levels. I am playing well enough so it is a bit sickening the way I lost with a fluke." In a predictable afternoon session, 2012 champion Selby had very little trouble beating edgy 20-year-old O'Connor. 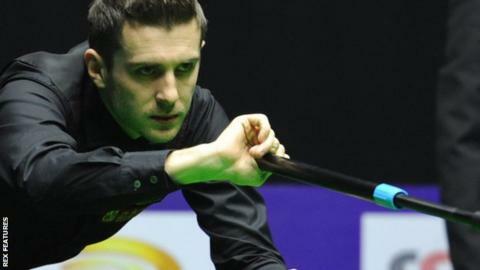 "I started well and put him under pressure from the off as I knew he'd be nervous," Selby said. Bingham had more trouble overcoming Brown despite the emphatic scoreline, but showed his quality as the match progressed to join Selby in round two. "It was a slow start and the first three frames could have gone either way so I need to tighten up," the 39-year-old said. "But then I made a couple of good hundreds and then finished the match off." Another former world champion, Australian Neil Robertson, who won the UK title in 2013, beat amateur Alex Taubman 6-3. The morning session saw Northern Ireland's world number 10 Mark Allen beat China's Zhao Xintong 6-2, while Barry Hawkins won a compelling final-frame black ball decider against veteran amateur Andy Hicks. Shanghai Masters champion Kyren Wilson and world number 30 David Gilbert were also winners on the final day of the first-round action at the York Barbican.